Join the academy, Start your career as a Beautician. We provide a professional training in Hair Dressing, Facial & Skin Care Techniques, Makeup & Mehndi, Bridal Dressing & Make-up. Providing Certificates along with Job Consultancy. Am’s Beauty Lounge & Bridal Studio – a Beauty Salon Training Academy. 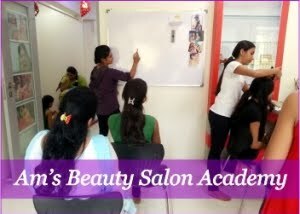 We provide Training to girls who wants to build their career as a “Beautician”. Apart from below listed Certified Training Courses we also provide job consultancy. List of Beauty Classes & Ongoing Batches. Join the academy, We teach for Beauty Parlour Classes,Mehndi Classes Thane,Bridal,Training. Book your seat today. Build your career as a Beautician. The beauty training programs are the courses offered for the students who want to pursue in the beauty sector. There are different beauty programs, some are the long term and others are the short term courses. Every year students enroll for these beauty courses & become professionals. We provide certificates as per training programs. We have modern training programs for Hair stylist. The hair styling course involves different hair related beauty services like hair cutting, bleaching, coloring, hair straightening, curling, also shampooing and styling as per the occasion. The professional field of hair styling is very competitive as well as lucrative. Website Designed by our regular client – Sushma Raut and Promoted Online by a team of professionals - Pickmyurl. Women love to adorn themselves to look their best. Our unique services include skin care treatments, bridal and hair services, apart from the beauty treatment. Prior appointments have to be made in order to avail the services of this salon. One of the most famous salons of Thane West, Am’s Beauty Salon caters to beauty requirements of ladies. Some of our unique services include skin care treatments, bridal and hair services, apart from the basic beauty treatment. This parlour is known for its hair styling techniques such as creative haircuts, hair coloring and re-bonding. Women love to adorn themselves to look their best. Our unique services include skin care treatments, bridal and hair services, apart from the beauty treatment. Prior appointments have to be made in order to avail the services of this salon. Hair stylists have to be capable of recognize a customers cues. Some clientele really don’t desire to speak while others are pleased to talk away! A hairdresser has to be capable of pick up on a clients wishes and respect them. Whichever salon is being chosen, the service it provides has to be up to the mark with all satisfaction of the client. One of the best Ladies Beauty Parlour in Thane west, Am’s Beauty Parlor, Beauty Salon, Thane West. Am’s Beauty Salon Academy, Bridal Studio.